I first had these rolls at Five on Black, the wonderful and entirely gluten-free Brazilian restaurant that just went in down town. 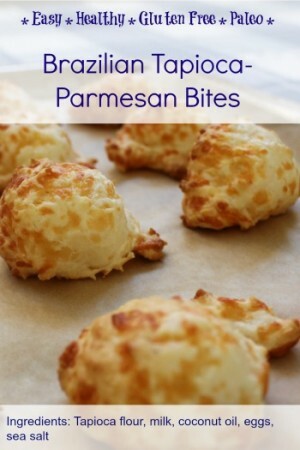 These cheesy bites are the perfect combination of savory Parmesan cheese and mellow flavor from the tapioca flour. They are crispy-crunchy on the outside and chewy with lots of air bubbles on the inside, and super simple to make! 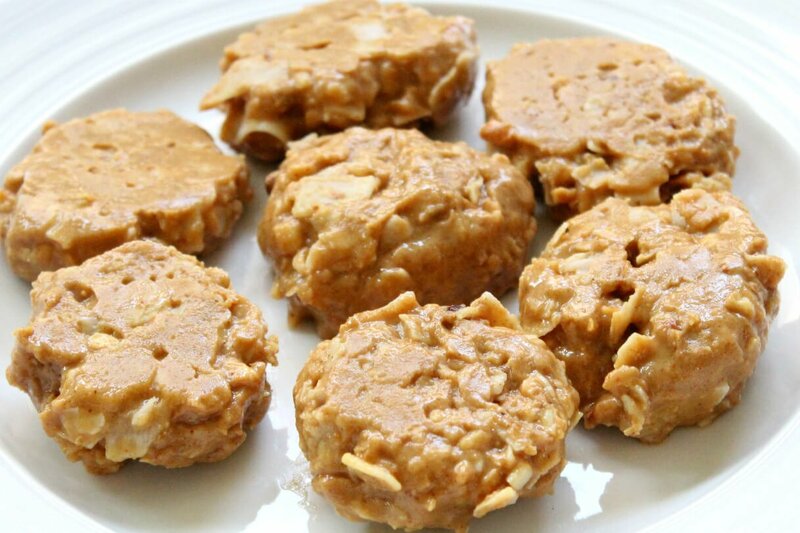 For those following the Gut and Psychology Syndrome diet, both fluid milk and tapioca flour are not allowed, but if you are eating grain-free, or paleo with milk, these bites are sure to be a hit! Tapioca flour is made from a root vegetable, the cassava root. Similar in consistency to corn starch, this white silky flour is common in gluten free baking. It is starchy, slightly sweet, and naturally gluten free. 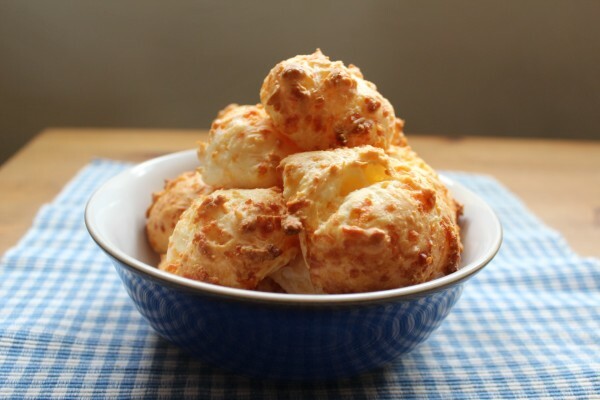 This Brazilian cheese bread packs wonderfully, it’s going to be a popular part of packed lunches this spring! In a medium saucepan, heat milk, coconut oil, and sea salt over medium heat for 2-3 minutes, or until boiling. Remove from heat and add tapioca flour. Stir in tapioca flour with a fork until there is no more powdery-dry tapioca flour. Move tapioca mixture to a stand mixer with a paddle attachment. Beat on low and work up to medium and continue mixing for about 5 minutes, or until comfortable to touch (not too hot) and mixture is smooth. Gently mix 2 eggs with a fork. Stop mixer and add half the egg mixture (one egg) and beat on medium speed until thoroughly combined. Add the other egg, and mix until thoroughly combined. Add grated Parmesan cheese, mix on medium-low speed until combined. Using a cookie scoop dipped in water to prevent sticking, place batter on parchment about 1 inch apart. Simple to make savory cheese rolls are a favorite from Brazil. Just made these. Perfect instructions, thanks! These are so yummy and seem like they could be quite versatile (throwing ground cooked sausage in the dough?? or taking out the cheese and seeing if they still bake up same way so can use them for eclaire shells??) Neat stuff. Will comment here if I try either way. Thank you!! I have not made regular eclairs for almost 3 years now, but I would say this shell is a bit on the harder/sturdier side than the wheat ones so it may not pair as well with whipped cream filling – too much contract from the hard shell to the light cream while the custards soaks through just enough to make a perfect eclair that still keeps it’s shape and creme inside. What a find! Thanks so much for sharing these!!! Still planning to try these with ground sausage thrown in to make them kind of like ‘breakfast cheese puffs’ :) Btw, both batches so far only needed 18-20min in our oven. SO EXCITED to have this recipe!! Thanks again! !